Greenehaven unit 4. Sometimes it's hard to improve on a great thing. 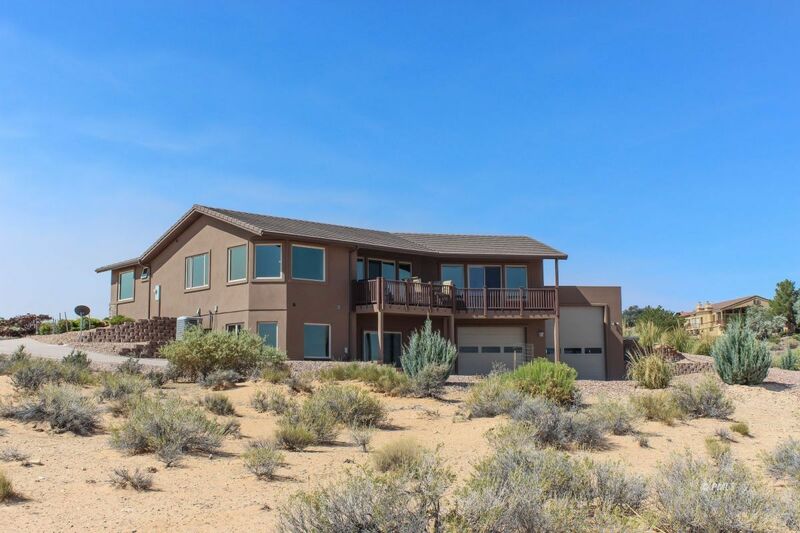 Here is a home fully equipped... 2 level, 3 bed, 4 bath sitting on 1.03 acres looking over the majestic views of Lake Powell. Home is expertly constructed with efficiency and comfort in mind. Certified green built home explains the properties low energy cost and low maintenance. Beautiful flooring, rock accented gas fireplace, grand high ceilings, custom built wooden cabinetry, granite counters & desirable open floor plan. Main living room flows into massive kitchen equipped with bar seating, movable center island, large refrigerator and counter to ceiling windows flooding the home with rich natural light. Finally! A home built to accommodate the lake lifestyle. 18' by 44' garage large enough for class A RV and adjacent 18' by 35' garage make for plenty of space to park the recreational vehicles. Wrap around cement drive makes for smooth access to all 3 attached garages. Fully landscaped yard includes drip system. Lower level offers additional living room with full service wet bar and easy access to homes utilities. Designed and constructed by a certified professional engineer. Live in comfort, live here.